Budget Truck Rental is a truck rental service based in Parsippany-Troy Hills, New Jersey, United States, that allows members of the public to rent vehicles between 10 and 24 feet long, for house moving and other purposes. It is a subsidiary of the Avis Budget Group, and makes over $350 million in revenue every year. Ronald L. Nelson currently serves as CEO and chairman, and the company permanently employs over 1,000 people throughout its various facilities. With 32,000 trucks in its fleet and 2,800 locations, Budget Truck Rental is the second largest public service of its kind in the country. Its roots can be traced to transportation company Ryder TRS, Inc., which was founded in the 30s. Budget Group acquired Ryder in 1998 and rebranded the truck rental division as its known today, expanding it much further in the decade that followed. Today Budget Truck Rental takes reservations by phone, in person at their locations, and over the internet at BudgetTruck.com, which was launched a year after the acquisition in 1999. As the name suggests Budget Truck Rental's main focus is renting truck to members of the public. Their base vehicles come in lengths of 10-feet, 12-feet, 16-feet, and 24-feet, depending on the customers needs. They have contracts with Navistar International, Isuzu, Ford, and GMC to manufacture their vehicles, and the make of the truck you receive will usually be one of these. Using the website is extremely simple, all you need to do is enter your location, the date you wish to pick up the truck and the date you wish to return it, and you will be displayed with a list of nearby locations and their trucks. You can then complete the reservation process online, paying with a credit card. As well as the core trucks, you can also include add-ons such as towing equipment, furniture pads, and various forms of insurance to keep your personal belongings covered during the move. 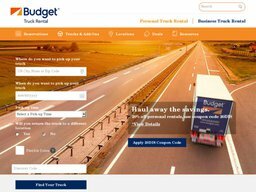 Budget Truck Rental accepts all major credit cards for their reservation service, including American Express, MasterCard, Visa, Discover, and Diner's Club. You can also make cash payments, check, and money orders if you wish to pay in person at a facility. Your rented truck will be available at the agreed upon time at the agreed upon pick-up location. When you're finished simply return it to the same location. If you find that you cannot make it to the pick-up, many locations offer a free pick-up service to get you to the facility. Reservations can be cancelled up to 48 hours before you are due to pick up the truck, with no charge. After this time you may be charged a $50 fee. If your truck should break down they offer a 24 hour roadside assistance service at 800-423-1640, and you may be eligible for your money back.